"Patterned Paper" is this weeks challenge at Cute Card Thursday, which wasn't too difficult for me, because I love to use patterned paper on my cards and projects. "Motivpapier" ist das Thema der Woche auf dem Cute Card Thursday challenge blog, was nicht allzu schwer für mich zu realisieren war, da ich es liebe Motivpapier auf meinen Karten und Projekten einzusetzen. I used the cute girl "Sitting with bear" for this card. Ich habe das putzige Mädel "Sitting with bear" für diese Karte benutzt. I used my Nestabilties and a selfmade template to create a "different" opening for the card. I have to admit that I don't own a big circle cutter, so I had to do my own template. I really like how the layout came out. I think I will use this again! I put some Stickles drops (Star dust) on the scallops of the circle and die some faux stitching around the image. The background paper is really sewed. This is the inside of the card. I used a Stampin' Up sentiment. Das ist die Innenseite der Karte. Ich habe hier ein Stampin' Up sentiment verwendet. Hop over to her blog and enter the draw! Meine Blogging Freundin Michelle vergibt auf ihrem Blog Stamps, Paper, Scissors and Donkey Smiles einen tollen Blogcandy um ihre ersten 5000 hits zu feiern (obwohl sie jetzt schon weit drüber ist :) Schaut doch mal bei ihr vorbei und macht mit! wow what a fab card love it. deine karte ist ganz zauberhaft geworden!!! Wow das Kärtchen ist mal wieder zauberhaft. Wunderschöne Farben, ein Traum. Fabulous card Katharina, what a gorgeous stamp! Love the papers and colour scheme. You make such beautiful cards. I just LOVE this one. Such great colours and I like the way that you´ve used the big flower! Fabulous card Katharina, the image is so sweet and the papers are just beautiful. I love the shape to the front of the card, very creative! Wie schaffst Du es bloß, jeden Tag eine so tolle Karte zu machen - und das auch noch mit zwei Kindern? *beeindruckt bin* Wieder wundervoll geworden! Wow!! Great coloring. The colors are so pretty. Another idea I'm going to have to try. 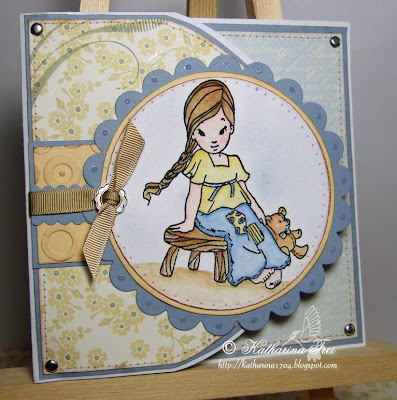 Gorgeous card Katarina, lovely colours. what a great card, I love the circle and a great image there!! Another fabulous creation Katharina! love the opening you designed and the pretty papers with that new stamp! Oh this card ROCKS! (that seems to fit the image for some reason!) Really love the layout and the opening, I may just have to try this out! And thanks so much for the link! Your the best! 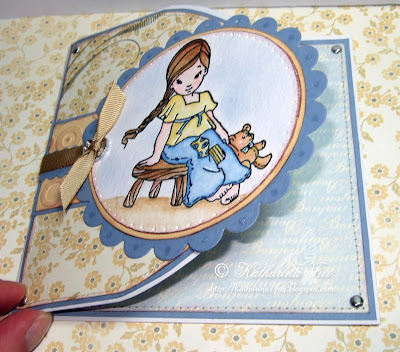 gorgeous card I love the style you have used. This is So Gorgeous! !..such a beautiful stamp, coloring and I love the shape and design of this card...Awesome. Katharina I used one of your wonderful ideas for ribbon on my circle card...uploaded too late and forgot to credit..I have edited it at the bottom of that post. Just wanted to let you know I used your idea and thank you again for that great ribbon tutorial! Love your creativity with the opening. I enjoy visiting your blog for inspiration. Thanks for sharing. By the way, your boys are adorable! Oo I love the card...so great the shape of the card! wow! what a beautiful card! I love how you used your ribbon slide. amazing coloring, stitching and layout, as always!! Tolle Idee, diese Form der Öffnung gefällt mir extrem gut! überhaupt die ganze Zusammenstellung ist wieder wunderschön, eine fantastische Karte! This is such a pretty card!! I love your color combo and the papers. The whole idea of the card is great, too!! Stunning! Love your paper is that image is oh so sweet,of course your coloring is wonderful as always! Die Karte ist wunderschön geworden, Katharina. Da passt wieder alles. Tolles Layout und klasse umgesetzt.